Here at Hit Zone we are HUGE fans of One Direction - and we know you are as well! That's why as our FIRST EVER CONTEST we're giving away a SIGNED ONE DIRECTION POSTER when we reach 1,000 followers on our Twitter page! The contest is all part of a brand new section of Hit Zone called 1D Zone! A section on Hit Zone 100% dedicated to One Direction! So how do you win? Here's the details! - Following us on Tumblr or adding us on Google+ also works for #2. This contest will end when we hit 1,000 followers on Twitter. 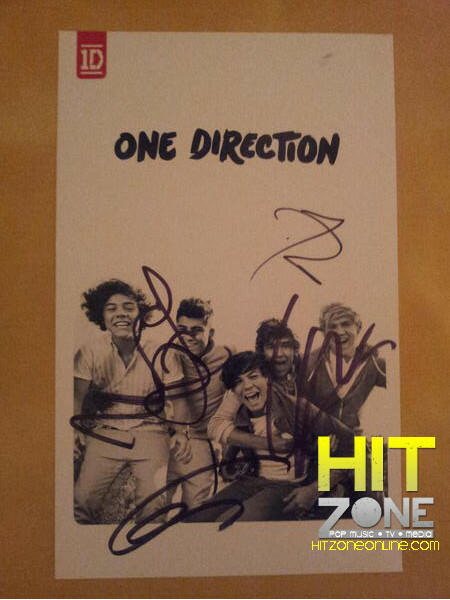 The winner will be chosen at random by searching for the hashtag "#HitZoneLoves1D" on TwitterDraw.com. The winner will be announced on our Twitter page. Questions? Hit us up and we'll answer them! This contest is open worldwide. Spread the word and good luck! We can't wait to give it away! Thanks for visiting Hit Zone!